Prior to making your decision to have a breast augmentation, it is important that you have a thorough understanding of the risks and complications that may arise from the surgery. This post is designed to provide you with information regarding the different types of breast implants, the facts associated with each and the advancements in breast augmentation. Although both saline and silicone implants have an outer silicone shell, they are filled with a different material and inserted differently. Dr. Duboys utilizes the Keller Funnel technique when it comes to inserting silicone breast implants. The Keller Funnel allows plastic surgeons to insert the breast implant with greater ease and accuracy –minimizing the length of scar as well as contact with exposed tissue. 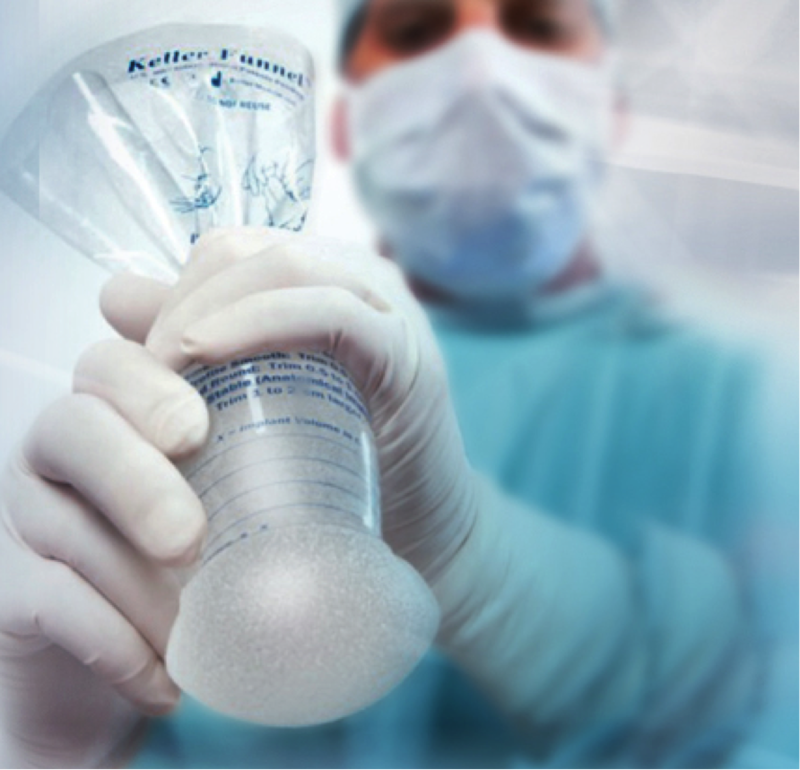 Utilizing a Keller Funnel the breast implant is inserted with minimal touch that greatly reduces the chance of infection. Silicone implants come prefilled from the manufacturer while saline implants are filled in the operating room. What If My Implant Ruptures? If a saline breast implant ruptures, this will cause the implant to deflate and lead to a smaller breast. Although saline may be absorbed through your body without causing additional harm, you will likely need surgery to remove the silicone shell. If requested, a new implant may be placed when removing the failed implant. Silicone implants have become a more popular choice over the years because silicon gel more closely resembles the feel of natural breast tissue. In the rare occasion that a silicone implant ruptures, it may go unnoticed for quite some time. Although leakage is not linked to health problems such as breast cancer, connective tissue disease, autoimmune disease or reproductive problems, it may cause pain or change in the shape of the breast. As with saline implants, a ruptured silicone breast implant will require surgery and may be replaced with a new one. If you suspect that your implant has ruptured you should contact your plastic surgeon immediately. Over the last few years, the advances made in surgical breast augmentation techniques have resulted in fewer infections, ruptures and capsular contracture (hardening of implants). More recently, doctors and scientists have been working diligently to eliminate the need for silicone and saline implants and instead, use fat cells to be transplanted into the breasts. Fat cells will reduce the amount of complications caused by breast augmentations because they are a natural substance placed into the body, rather than a foreign object the body may reject. Questions About Breast Implants & Breast Augmentation? Come See us. If you are interested in breast augmentation, and live in the Long Island, New York area, schedule a complimentary consultation visit with Dr. Duboys today. Based upon your body type, anatomy, and other factors, Dr. Duboys will assist you in choosing the implant that would best fit your needs. For more information regarding breast augmentations please contact us or visit our office at a time of your convenience.